If our public is asked to give their choice whether India should opt for war or diplomacy in response to Mumbai terrorist attack a large majority will vote in favor of war. Well public cannot be faltered for their feelings. The feeling of hurt caused by the attack and resultant loss of life and property and lack of response from Pakistan suggests that only way to teach a lesson to the perpetrators of attack where Pakistan is a party is to destroy the basis from where the terrorists are operating even if it means a war with Pakistan. In order to form a rational opinion we need to analyze the motivation for attack with full support of the Pakistan Military and ISI. Pakistan has tried its best to achieve a communal divide but has failed. It is beyond Pakistan to destabilize India. Two hundred casualties and damage to some of our institutes cannot stop the country from progress. Thousand cuts on India may be OK but real motivation of the attack appears to be internal situation in Pakistan. Democracy is trying to take route in Pakistan. The military is getting unpopular and is divided because of its operations against Taliban, nurtured by non other than them selves. Tremendous US pressure on Pakistan to fight the Taliban does not allow them to withdraw their forces from their western border. The Military does not want democracy to take permanent roots in Pakistan either. The only way for them therefore is to find an excuse to mobilize their forces against India in the East and seize power. The Pakistan Army therefore devised a strategy along with terrorist outfits operating from their country, particularly Lashkr-e-Taiba .and with full understanding of Taliban. Otherwise how come that Talban have opted to fight India by the side of Pakistan Army ? Mumbai terrorist attack was there fore a part of their strategy. They knew that general elections in India are shortly due and the Government of India will be under tremendous pressure to physically react to the attack. They almost succeeded in their aim when some of our people talked of surgical operation against the terrorist bases. But the Government decided against this course and instead followed the diplomatic route. May be the world opinion against war between two nuclear powers was a factor favoring this course! Emotive reaction of the people favoring war is understandable but political leaders like Mr. Rajnath Singh, BJP President, pressurizing the Government in favor of war is shear politics and against the interest of the country. He Knows that the Government is not likely to opt for war as an option, he is therefore trying to project PM and the UPA Government as weak. As a senior politician he should not underestimate the wisdom of the people. They understand that having patience is not a sign of weakness but a strategy. We have to realize that war is not a solution. This has been so even in Iraq and Afghanistan. In any case let us not fall in trap laid by Pakistan to get out from Afghan border on our name and at our cost. Let us not forget that what ever Pakistan leaders may say for consumption of their public they are under tremendous pressure of USA and other world powers. This will increase once Mr. Barak Obama takes over the reigns of power in USA. They have lost the support of even Muslim world. The ultimate choice before Pakistan is to fall in line or perish. They may opt for the latter is another matter. 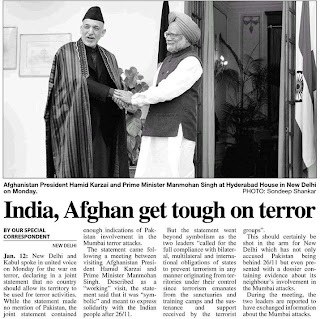 Expressing solidarity with India in the wake of the Mumbai terror attacks, Afghan President Hamid Karzai today joined Prime Minister Manmohan Singh in castigating Pakistan for reneging on its commitment not to allow the misuse of its territory for terrorist activities. Without directly naming Pakistan, the two leaders “called for full compliance with bilateral, multilateral and international obligations of states to prevent terrorism in any manner originating from territories under their control since terrorism emanates from the sanctuaries and training camps and the sustenance and support received by the terrorist groups’’. Karzai, who arrived here last evening on his second visit to New Delhi within six months, held extensive talks with Singh on a wide range of issues, but the focus was on the Mumbai terror attacks, carried out by elements in Pakistan with the support of its official agencies. Expressing deep anguish over the attack, Karzai is believed to have pointed out to the Indian Prime Minister how Pakistan’s notorious spy agency ISI was supporting terrorist elements in his war-torn nation. The two leaders are understood to have noted with concern that the fledgling civilian government in Islamabad had failed to do anything against the ISI even when it became evident that the spy agency had masterminded last year’s July 7 suicide bomb attack on the Indian embassy in Kabul. A joint statement issued at the end of Karzai’s talks with the Prime Minister and External Affairs Minister Pranab Mukherjee said Singh conveyed to the Afghan leader that following the completion of the Zaranj-Delaram road project, a second major infrastructure project, the Pul-e-khumri to Kabul transmission line and the sub-station at Chimtala in northern Afghanistan would be handed over shortly by India to the Afghan government. The two leaders expressed satisfaction that the construction of the Afghan Parliament, a symbol of the common commitment of both countries to pluralism and democracy, had also begun. Singh told Karzai that in order to help the people of Afghanistan in tiding over their current food crisis, India would gift Afghanistan 250,000 metric tonnes of wheat. The shipment would be effected immediately after the Afghan government had worked out its transportation arrangements. The Prime Minister also accepted an invitation from Karzai to visit Afghanistan. Amid reports of the Barack Obama administration planning to appoint a special envoy for India and Pakistan, outgoing US Ambassador David C Mulford has said Washington should not “insert” itself as a “referee” between the two South Asian countries. “I think the two sides (India and Pakistan) should be encouraged but the United States should not insert itself as the manager or the referee of the process,” Mulford said in a TV interview. He, however, said, “I think the foreign policy which has encouraged both the sides to talk without inserting United States in the middle has been the right thing to do. The Bush approach has been successful. It has produced good results.” The Ambassador’s comments came in the midst of reports that the next US administration may appoint former diplomat Richard C Holbrooke as a special envoy for India and Pakistan. Describing Kashmir as a “very special problem” which has to be solved by India and Pakistan by themselves, Mulford said he had spent five years de-hyphenating the relationship between the two countries. ONLY a heartless person will not get moved by seeing a child crying over the dead body of his father, or the severed head of a teenager being removed by soldiers. Newspapers and TV channels continue to carry such horrifying pictures of innocent Palestinians being killed daily since Israel launched its military offensive in the Gaza Strip on December 27. The Israeli military’s crackdown has been getting fiercer with each passing day with the world community unable to do anything about it. It was feared the conflict might spill over to other areas with pro-Hamas elements firing a few rockets into Israel. Lucking, this did not happen. So far, over 900 Palestinians are reported to have been killed and thousands injured. The statistics, however, cannot present the true picture of the devastation caused. There are only a few hospitals in Gaza and all of them are overflowing with the injured. The Israeli offensive is aimed at eliminating Hamas, the extremist organisation which came to power after winning the elections held under international supervision. Hamas, however, has been attacking Israel’s border areas with rockets off and on after the six-month ceasefire between the two sides came to an end on December 19. Israel believes that peace is possible if Hamas is immobilised. That is why, instead of seeking a fresh truce agreement, Israel went ahead with its plan of eliminating Hamas. But can peace be established by killing innocent people? Israeli troops have been able to eliminate a few Hamas fighters. But once the military conflict is over, Hamas may re-emerge as a more broad-based representative body of the Palestinians. It is surprising why the Israeli leadership cannot understand this reality. 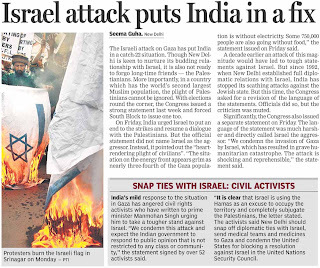 As Prime Minister Manmohan Singh said last Thursday, the hostilities in Gaza must come to an end soon so that a settlement based on dialogue could be arrived at. Such a possibility appears to be in sight with Israel indicating that it may stop its military operations anytime now. It has responded positively to the peace proposals presented by Egypt and France. Let us hope they succeed in preventing further bloodshed in the name of establishing peace. But will military change its mindset? THE terrorist attack on Mumbai remains at the heart of the Indo-Pakistani relationship because it has snapped the element of trust that was gradually building up since the historic agreement between President Pervez Musharraf and the then Prime Minister A.B. Vajpayee in January 2004. For India, the core of the agreement was the promise that Pakistani-controlled territory would not be used for anti-Indian activities. The successor Manmohan Singh government followed up with new initiatives in trade across the Line of Control in Kashmir and elsewhere and the process of people-to-people interactions bloomed. When Pakistan’s civil society helped topple the Musharraf era, India applauded although there remained lingering doubts over how a fragile civilian dispensation could help the budding peace process. The Mumbai attacks came like a bolt from the blue because they implied many things, as investigations were to reveal later. Pakistan had never removed the terror infrastructure from occupied Kashmir or its soil. Elements of official agencies, the ISI spy agency in particular, had helped stage the horrendous Mumbai plot. And jihadis were freely spreading poison against India and collecting money for their nefarious activities. A warning light came on with the bombing of the Indian Embassy in Kabul with the complicity of the ISI. The repercussions of Mumbai’s 26/11 have still to run their course. India is relying on international diplomacy and countries such as the United States with influence in Pakistan, rather than threatening a ruinous war, to underscore national concern over a tragedy that has cut the country deep. The question being asked is: How can one do business with a neighbour who plots to murder Indians and foreign guests in the heart of the country’s financial capital? Even assuming that the civilian Government of President Asif Ali Zardari was not in the loop on 26/11, its members were responsible for letting terrorist workshops flourish and turned a blind eye to jihadis’ fund raising and plotting for their jihad against India. Besides, if the Army and its spy agency are bent on subverting and harming India in any way they can and remain the power centres in Pakistan, what prospect can there be of achieving peace and reconciliation between the two countries? There are voices in Pakistan suggesting that India should help civil society in its neighbouring country to strengthen its position vis-à-vis the Army establishment. Indeed, Pakistan’s civil society deserves credit for battering General Musharraf, compelling him to leave office. But the opposition forces that succeeded him were riddled with factionalism and soon split up. And even the Pakistan People’s Party is showing cracks, pitting the Prime Minister against the President. Let us give the benefit of the doubt to President Zardari and his party and treat the dissembling and obfuscation they have indulged in on 26/11 as par for course. There has been a measure of posturing on the Indian side as well. 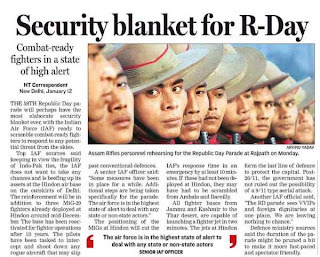 But the civilian dispensation seems to be losing ground to the Army and India cannot rescue it. Even the retired General Musharraf has emerged from the woodwork to voice war rhetoric. New Delhi has to deal with the reality of the Army’s continuing central role in the power centres that govern Pakistan. For a time then India is at a dead end in its relations with Pakistan even as Pakistan officially chooses to acknowledge in driblets the provenance of 26/11. Islamabad will in all probability continue to deny any official role in the Mumbai horror. The more important point for New Delhi is whether the Army will review its own, or the ISI’s, role in trying to subvert India. The jihadi outfits represent a threat to Pakistan’s ruling establishment as well. Foreign Minister Pranab Mukherjee says that the peace process between the two countries, such as it was, is on hold. He is stating the obvious, but calls for more drastic measures in expressing India’s displeasure are likely to prove counter-productive. 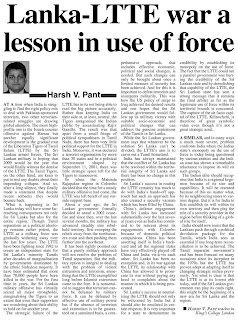 India has to deal with Pakistan because it will remain a neighbour and retaining diplomatic outposts and the trade channels that exist is sensible. The onus is on Pakistan to demonstrate that it is willing to do something about India’s legitimate concerns to assuage the shock of 26/11. Merely detaining leaders of banned outfits and closing their offices do not impress New Delhi. Rather, the Army must take substantive steps against those who are encouraging and engaging in subverting India; to do less would only destabilise Pakistan in the long run. Pakistan is churning and how far the Army could and would change its mindset about the role the country should play in the regional and wider framework is an open question. The days of General Zia-ul-Haq saw the Islamisation of the Army to an extent and the indoctrination was helped by the institution’s theory of employing Afghanistan to give “strategic depth” to Pakistan against India. The Army and the ISI, therefore, nurtured and helped the Taliban in taking over its neighbour. The Pakistan Army’s plan to rule Afghanistan through a proxy force was shattered by terrorist attacks on America in September 2001 and the resulting American “war on terror”. Islamabad had no real choice but to fall in line with Washington’s wishes and the US military offensive against Afghanistan had a consolation prize for Pakistan. It became the primary cog in America’s “war on terror” in Afghanistan receiving much valuable military assistance in the process. Given the difficulties American and NATO forces are facing in Afghanistan in subduing a resurgent Taliban, a section of the Pakistan Army is making new plans in the hope that Western forces will tire of their arduous task and leave the area. The assumption is that the field will again be clear for Islamabad to hold sway over Afghanistan. The Army’s attitude towards India will depend in part on the evolving Afghan situation although it seems unlikely that Washington would want to sacrifice Afghanistan in its regional scheme of things. Pakistan’s approach to India will be determined as much by its fortunes in Afghanistan and the attitude the new Obama administration takes to Islamabad’s complex political equations as to its Army’s realisation of the benefits of good relations with New Delhi. IN Feb 1981, the IAF was doing a firepower demonstration at Tilpat Ranges near Delhi. As Commanding Officer of the only Army unit at Gurgaon and Station Commander, as also being close to the Ranges, I received a flash signal late one night, to receive the President and the PM the next morning at the helipad of the demonstration area at a given time! 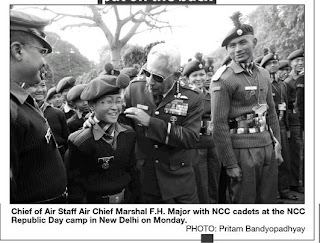 I took it seriously, despite knowing that all three “chiefs” were sure to receive the VVIPs; because, regulations for the army lay down that the station commander would receive the VVIP; higher HQ right from Army HQ (Staff Duties Directorate) down to Ambala Sub Area had sent me signals not only to do so but sought acknowledgement of the same! The IAF police stopped me at every major junction and asked for a car pass and spectator pass! Ceremoniously, I would take out the Army HQ signal and show; then they would allow me to proceed, but till the next check point! I sat down and waited. Yes; all three Chiefs did come and received the VVIPs! Meantime, my daughter saw Ms Minu (then Talwar), the DD Newsreader (remember, it was Doordarshan monopoly!) and wanted to meet her; I let her go! She brought back an autograph too! Former Prime Minister Narasimha Rao is famously reported to have once said that “No decision was also a decision”. This aroused much laughter at that time in socialite drawingrooms but something of that ilk is now the subject of a raging debate in this country following 26/11. Is there a military option, is the question being asked. A couple of hundred years ago, Clausewitz had, once again famously, postulated that war was the continuation of policy by other means. His formulations, treated ever since as sacrosanct by those involved in the practice of statecraft, are now seen to be out of date by some even as others continue to swear by them. In India, stated to be lacking in strategic vision, this wizard of strategy has little relevance as we are more comfortable looking at things in the present and reacting to them which needs neither formulation nor understanding of broad concepts. It is not surprising, therefore, that we are articulating a series of views, which are, at best, confounding ourselves, and, in the worst case, simplistic in the extreme. That the military option should be the last in the menu of choices requires no great intellect to comprehend. So, if inflicting ‘cost’ on that country is seen as the last course of action, this would be an absolutely legitimate and wise decision. However, to take the view that there is no military option is something that defies common sense. Nation states maintain armed forces commensurate with their felt needs — to impose their will on others, as a deterrent to threats from present or potential adversaries, and as a symbol of their sovereignty. Military power is only one element in the totality of a nation’s strength in which ‘soft power’ as represented by culture, economy et al is also an important element. To argue that any one of them is unusable is meaningless inanity. India spends the enormous sum of Rs 100,000 crore on maintaining its armed forces, a figure four times its outlay on health and education; this huge expense is, obviously, wasteful if the military option is not exercisable. Similarly, to suggest that such a choice does not exist in regard to Pakistan because it has nuclear weapons makes little sense because then we do not have it in regard to China too. On the same logic, these countries also do not have a military option against us. 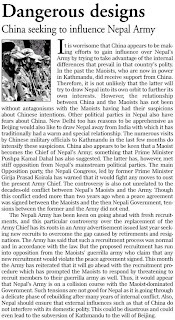 What this boils down to is that our armed forces are being sustained to be used, if required, against countries like Nepal, Bhutan, Bangladesh and Sri Lanka. It cannot be anyone’s case that we can happily go to war, even with a country over which we have overwhelming superiority, but, concurrently, the argument that war is ruled out as a possibility is also devoid of any rationale. That option must always be there to sustain the nation’s interest, if and when required. Calculation of the ‘pros and cons’ of using that option, as of any other, is a different matter but that does not mean that we can, simplistically, discard it off hand. Another disturbing element of the debate has been the appearance on national TV of retired people, both military and civilian, who have held high positions while in service. At least two former Service Chiefs and a Foreign Secretary have not thought it unwise to air their views on whether there are any military options and, if so, what these might be. One of the former uniformed men argued that the military leadership should not succumb to political pressure. There was also an assertion that the use of force would invite disaster as our preparedness was weak. On the other side, it was suggested that the composite dialogue should be immediately suspended. To visualise contingencies and to prepare for them is the most important responsibility of people in high positions and all those mentioned above have done this on a continuing basis during their tenures. When they come out in the open and air their views, they unconsciously reveal the trend of possible choices, unhappily, to the adversary’s advantage. Since the menu is finite, such public articulation circumscribes the government’s flexibility. It is much like the unrestrained and uninhibited 24/7 portrayal of 26/11 events by the television media when every piece of our response was revealed, in real time, to the handlers in Pakistan. One can be sure that both in the headquarters of the armed forces and in Foreign Ministry, options and choices are being evaluated continually and this is well known to those who are no longer in positions of responsibility or accountability. Reticence from them would serve the nation’s cause better than needless volubility. So we must do what is necessary in the national interest and leave it to those responsible for safeguarding it. The military option will surely be the last one to use, if at all; by the same token, it cannot be taken off the table. THE response of a country to another country's demand is directly proportional to the leverage which the latter exercises. In the case of India and Pakistan, India has no leverage worth the name. The experiment of mobilising its armed forces and threatening Pakistan has proved to be a damp squib because of the possession of nuclear weapons by both the countries. Pakistan will react in the way which we want only if our actions, which though non-violent in nature, have the potential of inflicting costs which are beyond its capacity to bear. The Prime Minister had referred to it when he had said “We will take up strongly with our neighbours that the use of their territory for launching attacks on us will not be tolerated and that there would be a cost if suitable measures are not taken by them”. There are three areas which if India acts on aggressively, can have a very adverse effect on Pakistan’s economy and society. No Pakistani government will like to be confronted with problems which could lead to the break-up of the country. They would have to weigh the cost benefit ratio of the policy being followed now against India vis-a-vis the possibility of break-up of Pakistan. The first one is the threat of revocation of the Indus Water Treaty of 1960. The second is the threat of providing, as Pakistan does to the Kashmiri separatists, "morale and political” support to the various groups fighting for liberation from Pakistan. The last one being restarting of covert operations in Pakistan against the masterminds of LeT and other such organisations which are involved in planning and executing terrorist attacks in the country. As per the Indus Water treaty, Pakistan has full rights on the use of the three western rivers (the Indus, the Jhelum and the Chenab). India has, on the other hand only very limited consumptive use rights on these rivers, but full rights for non-consumptive uses. If one looks at the map of Pakistan what strikes one is that all the major rivers originate or pass through India and the headworks are located in India. Pakistan, being arid or semi-arid, depends to a major extent upon the Indus river basin waters for its agricultural and other needs. Fortunately for Pakistan, India has always abided by the Indus Water Treaty even during the wars fought so far and allowed the flow of water. This is one weapon which needs to be exercised. Pakistan cannot expect us to abide by treaties when it does everything to break up India by using militant groups as an extension of its foreign policy towards India. The second arrow in our armoury should be the insurgencies in Pakistan. We should extend all morale and political support to the various groups fighting for liberation from Pakistan. This also would pose a serious threat to Pakistan's stability and it will have to choose between break-up of Pakistan verses attempts at destabilising India by supporting terrorist groups. The third arrow should be the starting of covert operations in Pakistan. The perpetrators of terrorism in India must not be allowed to feel safe in Pakistan or anywhere else in the world. These men must feel the heat of retribution. In world politics, like in real life, “nice guys” don’t come out winners. In a world which is not perfect, to be able to achieve one’s potential, one has to be “street smart” and that is what India has to be. We have, after each war with Pakistan, lost out at the negotiating table by being the nice guy. We stopped operations in 1948 and went to the UNO when we were winning the fight in J & K, returned Haji Pir Pass after 1965, and did not get Bhutto to agree to a permanent settlement of the Kashmir issue. We have now to become “street smart” if we want to protect our country. Pakistan Monday ruled out a war with India over the Mumbai terror attack, even as a leading columnist said it was yet to respond to the Indian evidence linking Pakistanis to the mass slaughter. Holding that the two countries and their people cannot afford another conflict, a key aide to Pakistan Prime Minister Yousuf Raza Gilani said: "I don't see any chances of war. Both (India and Pakistan) want peace in the region that is imperative for the development of their people." The aide, Rehman Malik, was speaking to reporters in London after meeting Mutahidda Qaumi Movement (MQM) leader Altaf Hussain, who lives in exile. 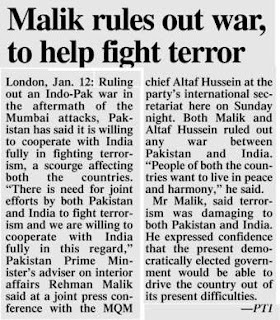 Malik is to meet British officials on the tension in South Asia, official sources said. He is to meet Home Secretary Jacqui Smith to share Pakistan's response to the evidence India has provided on the deadly Nov 26-29 Mumbai attacks that killed around 170 people. Media reports said that Malik stressed the need for joint efforts by Pakistan and India to fight terror and that Islamabad was ready to fully cooperate with New Delhi. He said terrorism was damaging to both Pakistan and India and they needed to work together to meet the challenge. Writing about the evidence India has furnished regarding the Pakistani links to the Mumbai massacre, columnist Amir Mir wrote in The News daily Monday: "The Pakistani authorities were still examining the dossier and their reaction was expected shortly." Mir appeared to contradict Gilani, who had said Friday that the Inter-Services Intelligence (ISI) spy agency had given its feedback to New Delhi about the Mumbai attacks. According to the dossier, "the evidence gathered so far unmistakably points to the territory of Pakistan as a source of the terrorist attacks in Mumbai. It is abundantly clear that senior functionaries of the Lashkar-e-Taiba were the controllers/handlers of the 10 terrorists", Mir wrote. "The evidence clearly establishes that the terrorists were chosen, trained, dispatched, controlled and guided by the Lashkar, which is the organization responsible for terrorist attacks in Mumbai." In the second section of the dossier, Mir wrote, "India has pointed out the contradictory nature of the Pakistani response to the Mumbai attacks, Islamabad's failure to respond appropriately to Indian requests for cooperation when evidence was provided in the past about terrorist acts, and an outline of Pakistani bilateral and international commitments and obligations to take the terrorists to task. "The third and last section of the dossier contains an outline of what the Indian government expects Islamabad to do in the aftermath of the Mumbai attacks," Mir wrote. "This was a conspiracy launched from Pakistan. Gaps in knowledge can be filled by investigation and interrogation of conspirators there," the dossier concluded. Commenting on the frostiness in Pakistan-India ties in the wake of the Mumbai terror, Dawn newspaper said in an editorial: "Given the vitriolic exchanges between the two governments, the need of the hour is to moderate their tone to improve the political climate in South Asia if the peace process is to be revived. "Both sides, one can presume, understand the importance of negotiating their disputes. But it is a pity that leaders on both sides have allowed political expediencies to determine the course of events," Dawn said. It also urged Gilani to "work earnestly to put an end to the war of words that has devastated the atmospherics in the region. "This would call for a tacit understanding with India requiring both governments to stop playing to the gallery and refraining from negotiating in the glare of media publicity," Dawn said. India has said that all 10 terrorists who sneaked into Mumbai by sea and went on a killing spree were Pakistanis. Islamabad initially denied this but later accepted that the lone terrorist caught in Mumbai was indeed a Pakistani. All other terrorists were killed. There is no sign of war in the border regions, a top Indian army officer said on Monday. "I see no war cloud in the Indo-Pak border regions," General Officer Commanding-in-Chief of Army's Central Command Lt Gen J K Mohanty said in Bhubaneshwar. Ever since terrorists of Pakistani origin launched an attack at the heart of Mumbai, there has been fears of India going to war with Pakistan. India has always wanted a friendly relation with its neighbours, but, it was 200 per cent ready to deal with any situation if they cross the limit, he said. When asked about the reported troop mobilisation by Pakistan after the November 26 strikes, Mohanty said India was hardly bothered about such an exercise. "India will pay back in the same coin, or even in a more meaningful way if Pakistan dares attack us," he said. Stating that Pakistan had been isolated across the globe following the terror attack, he said Islamabad would never dare to launch attack. "We are sure Pakistan will never repeat the same mistake it did earlier." Lieutenant General Mohanty's statement came a day after Air Chief Marshal F H Major said the forces were ready to meet any eventuality. To a question on Maoist problem in Orissa and some other states, Lt Gen Mohanty said it was the state government's responsibility. "If they (states) require army help, we are ready for it. But the army should be approached as a last resort," he pointed out. Appreciating the steps taken by the Orissa government to tackle the increasing left wing extremist activities, he said it had already recruited 400 ex-service personnel to fight the Maoists. Besides, the state government had decided to recruit 1594 more former defence personnel, Mohanty said, adding the "the army may consider setting up its unit in Maoist affected districts of Orissa, if the state government asks for it." He said the army had already trained Orissa police personnel to deal with improvised explosive devices. If required, the army would not hesitate to train more police personnel. Disapproving the idea of establishment of army regiments on the basis of states, Mohanty said the practice was introduced by the British who wanted to keep India divided "even among the defence personnel". Earlier, the state government had demanded establishment of Kalinga regiment in the army. Mohanty, however, said it was unfortunate that youths of Orissa did not get proper representation in the army. "Instead of demanding a separate regiment, we should ensure that youths from the state get adequate placement in the army," he said. Two Armymen have been arrested in Jhansi district for allegedly misbehaving with a woman, home department officials here said on Monday. Anup Kumar and Ganga Prasad of 228 Medium Regiment posted in Lalitpur district were held on Sunday by local residents when they were allegedly in inebriated state and misbehaved with a woman, they said. They were arrested by the police and a case was lodged against them. NEW DELHI: Indian Army has begun investigations into a security failure that allowed eight to 10 militants to escape the cordon of 2,000 troops after a nine-day encounter in the Poonch region of Indian-held Kashmir. Defence sources have denied reports they were provided ‘safe corridors’, and believe the officers commanding the operation have been asked to explain. The eight-day siege of the Bhatidhar forests in Poonch was called off after the army and police moved in following a three-day calm, and found the jungles and caves empty. Officially, the Indian government has blamed the weather for the humiliation. The militants killed two soldiers – including an officer – and a policeman, but apparently suffered no casualties, although the Indian Army had earlier claimed killing four Jaish-e-Muhammad fighters. A brief army statement said the “possibility of terrorists having slipped out taking advantage of the rugged terrain and prevailing climatic conditions cannot be ruled out”. “You can only have an idea of what this terrain is if you personally visit it,” Brigadier Gurdeep Singh told reporters. He added that the troops had destroyed three caves that the militants were using. NEW DELHI: Soon after the huge tri-Service amphibious warfare exercise `Triveni' came to an end on the western coast, the Navy is once gearing up to launch wargames in the Arabian Sea: this time, with the Russian Navy. The biennial "Indra'' naval combat exercise between India and Russia will be held in the last week of January, even as Indian warships continue to remain in a high state of operational readiness in the wake of the 26/11 terror strikes in Mumbai. 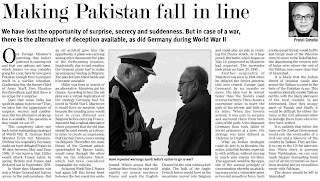 Triveni, as was first reported by TOI, witnessed the coming together of several warships from both the western as well as the eastern fleets on the western coast, with significant participation from IAF and Army, at a time when military tensions were at a peak with Pakistan. Though the war rhetoric has died down a little, the Indian armed forces continue to be operationally ready to meet any eventuality. For the Indra exercise, the Russian flotilla of six warships is being led by the large nuclear-powered missile battle-cruiser Pyotr Veliky (Peter-the-Great) and also includes destroyer Admiral Vinogradov. India, in turn, will field a Delhi-class destroyer and a guided-missile frigate, among other warships, for the exercise. "The Russian warships will also make a port call at Goa. This will be the fourth such naval exercise with Russia,'' said an official. India and Russia, of course, are currently engaged in resolving "outstanding issues'' over the lease of a nuclear-powered submarine and huge cost escalation in aircraft carrier Admiral Gorshkov's refit. As earlier reported by TOI, India is likely to pay as much as $2 billion more to get the 44,570-tonne carrier by end-2012, over and above the original $1.5 billion package deal of January 2004 for a fully-refurbished Gorshkov and 16 MiG-29Ks. Moreover, the defence ministry recently approved the Navy's case for acquisition of 29 more MiG-29Ks for Rs 5,380 crore. These MiG-29Ks will be deployed both on Gorshkov and the 37,500-tonne indigenous aircraft carrier being built at Cochin Shipyard. The long-standing Indo-Russian defence partnership, which saw India's military imports and tie-ups with Russia exceeding $35 billion since the 1960s, has run into rough weather in recent times. As a matter of policy, India is now increasingly looking at US -- apart from Israel and France -- to procure high-tech weapons and platforms. But Russia will continue to remain India's largest defence supplier for several years to come, with ongoing contracts and projects in the pipeline worth well over $15 billion. Rampur (Himachal Pradesh), Jan 12 (ANI): A two-day defence exhibition of the Indian Army was a major draw for the rural folk at Rampur in Himachal Pradesh. Army personnel present at the exhibition said that the aim was to educate people about the weapons and to motivate the youth to join the Indian Army. "The aim is to educate the people about the weapons. We want to interact with the youth and motivate them to join the Indian army," said Lieutenant Colonel Rajeev Shina, a commanding officer. The exhibition was successful in instilling patriotic fervour among the youth and motivating them to join the army. "There is a need to have more such exhibitions especially when India and Pakistan are having a strained relationship. Villagers should also be trained to fight for their country," said Aatam Singh, a resident. Hundreds of villagers, school and college students thronged Rampur, on Sunday, the concluding day of the exhibition. Young boys and girls also said that they were very keen to learn more about the army. Many expressed their desire to join the National Cadets Corps. Girls said that they wanted to undergo weapon training for self-defence. The exhibition was organised ahead of the 61st Indian Army day to be celebrated on January 15. NEW DELHI: The three Defence services have wrapped up one of the biggest war games on the Western sea front where they practiced new concepts of synergised operations. The exercise, called Triveni, took place around Lakshadweep islands. It was officially declared closed on Sunday after a week-long operational phase. At the centre of the drills was the heavy naval deployment with the Air Force and Army working around it. The officials said the tri-service exercises have been taking place almost every year but this, by far, was the biggest mobilisation of naval assets in recent times. Almost the entire Western fleet was at the job and even platforms from the Eastern fleet were deployed. The most notable was the participation of newly acquired Landing Platform Dock (LPD) INS Jalashwa. The focus of the drills was practicing a scenario where an Indian island has been taken over by the enemy and it has to be defended by an offensive action. The amphibious assault capabilities were displayed with the help of the warship that was earlier part of the US naval fleet. India had recently come out with its amphibious war doctrine and Triveni was the forum where it was practiced. The aerial support was provided by the Su-30 MKI fighter jets. Navy’s own aerial assets like helicopters and surveillance aircraft were used to test their capabilities and response timings. The timings of naval mobilisation might have caused anxiety to Pakistan as the mobilisation took place soon after the Mumbai attacks. The officials, however, maintained that the exercises of such magnitude are planned much in advance. There have been several smaller editions of tri-service exercises in the past. The lessons learnt and refinement of procedures would now move to discussion tables of military leaders. The de-briefs would be studied to find out the level of preparedness. After the Mumbai attacks, focus has been shifted to maritime security. Apprehensions have been raised about possible scenarios where terror groups can take over uninhabited islands in the Indian territory to use it as a base for launching attacks. The security agencies have already been told to keep vigil on the security around the islands. It is a challenging task as the number of islands in the Indian waters add up to over one thousand.